Heineken, the world’s third-biggest brewer, is taking a leaf from Nespresso owner Nestle’s book with the Sub, a beer-making machine for drinkers who want a freshly pulled pint at home. This sub is shiny, sultry, sleek and sublime. Kinda part K-cup machine and part keg. 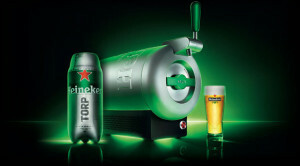 It comes with a special two-litre keg called the Torp, and offers beers from Heineken, Affligem, Desperados, and Birra Moretti Baffo d’Oro. This sleek tap houses a two-liter keg called “The Torp” — they really committed to that abbreviated nautical terms theme — and comes with a 15-day freshness guarantee. It’s also supposedly wildly eco-friendly, plus it comes with a free magnetic drip tray, you guys. Unfortunately it won’t be ready until next year, and it’ll go to France and Italy first. But still! Start brainstorming appropriate names for your pint glasses (perisco’s?) now. The Sub will begin its submerge into French and Italian homes in early 2014. Bringing for the first time a sleek-sublime keg-like homebrewing system; sorry to those American men, you’ll be stuck with your typical Ameri-Can’s for a little bit longer. This futuristic anodized aluminum is sub designed to keep beers like Affligem, Desperados, and Birra Moretti Baffo d’Oro as well as Heineke chilled to approximately 2 degrees Celsius, 35.6 degrees Fahrenheit, and fresh for 14 days. The machine is also wildly eco-friendly and comes with a free magnetic drip tray. Plus, there’s glassware, mats, a skimmer and serving case — served separately. Thanks for sharing this paragraph,,I like it. I’ll drink to this. Good stuff from the guys who own the market on green bottles. Dare I say…. We all yearn to live in a green submarine? Copyright © 2019 Howard Davidson Arlington, MA. All rights reserved.